If you book our Port Stephens day tour, we promise to show you paradise! Port Stephens is just over two hours from Sydney and worth a visit all year round. It boosts 26 stunning golden beaches, National Parks, diverse marine life and is a great little Sydney escape. Visit an awesome Australian wild life park, see playful dolphins on our dolphin cruise, explore stunning beaches, take a 4WD trip on the beach and slide down huge dunes. If you love nature and adventure, this is the trip for you! One of our awesome guides will pick you up early morning and soon you'll find yourself going over the Sydney Harbour Bridge towards the mid north coast of New South Wales. Our first stop is Walkabout Wildlife Park where you get up close and personal with Aussie wildlife! Pet a kangaroo, feed the farmyard animals and say G'day to the resident Emu! When we arrive at Port Stephens, take a break for lunch (own expense) at Nelson Bay, the main town of Port Stephens. There are a few cute little souvenir shops around so feel free to have a browse and take in the local atmosphere. Then we board a boat to go dolphin watching! 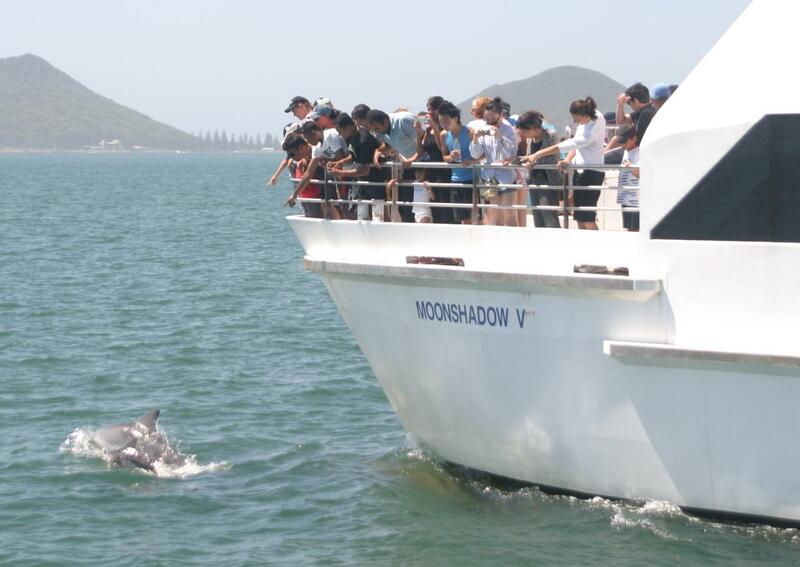 The region is home to over 150 playful bottlenose dolphins who are known to play around the boat. You can grab a complimentary coffee or tea and spot these grey beauties from the spacious viewing deck or jump in the boom net attached to the boat to get up close and personal. During June and October you can upgrade to our whale watching cruise. The annual whale migration takes place around this time with plenty of whales playfully showing off some acrobatics as they make their way along the coast. After our dolphin time, we take you sandboarding at Stockton Beach! We will jump in a big 4WD and cruise over the huge Anna Bay dunes to find the biggest drops possible to go down! Embrace the challenge, take a deep breath and whizz down huge the sand dunes on a boards especially designed to fly down sand! 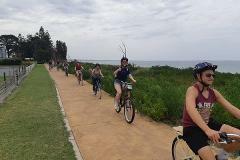 Our Port Stephens day tour departs every Wednesday and Saturday from Sydney, all year around! Looking forward to having you on our tour so we can show you to this stunning part of Oz!